Cumbernauld (/ˌkʌmbərˈnɔːld/; Scots: Cummernaud /ˌkʌmərˈnɔːd/; Scottish Gaelic: Comar nan Allt) is a town in North Lanarkshire, Scotland. It is the ninth most-populous locality in Scotland, positioned in the centre of Scotland’s Central Belt. Geographically, Cumbernauld sits between east and west, being on the Scottish watershed between the Forth and the Clyde; however it is culturally far more weighted towards Glasgow and the New Town’s planners thought to fill 80% of its houses from Scotland’s largest city to reduce housing pressure there. Cumbernauld was marked by the Romans in antiquity. Traces of this are still visible today for example at Westerwood and, less conspicuously, north of the M80 where the legionaries surfaced what would later be called the Auld Cley Road. This is acknowledged in Cumbernauld Community Park, also site of Scotland’s only visible open-air Roman altar, in the shadow of the imposing Carrickstone Water Tower. For many years Cumbernauld was chiefly populated around what is now called The Village with the medieval castle a short walk away surrounded by its own park grounds. The castle frequently hosted visiting royalty and the grounds were famous for their white cattle which were hunted in the oak forest. The town began to spread as the weaving industry of the village was supplemented by mining and quarrying as travel across Scotland became easier due to the Forth and Clyde Canal and the railways being constructed. Cumbernauld Railway Station, though some distance from the village, improved communications with Glasgow, Falkirk and Stirling. Cumbernauld was designated as the site for a New Town on 9 December 1955. This led to rapid expansion and building for about 40 years until the town became established as the largest in North Lanarkshire. At the UK census in 2011, the population of Cumbernauld was approximately 52,000, housed in more than a dozen residential areas. Cumbernauld‘s economy is a mixture of some manufacturing, mainly on its industrial estates, as well as service industries in the Town Centre and in sites close to the M80. Roman propaganda on a distance slab? Subdued native as depicted on Roman engraving. This sandstone slab was found at Arniebog Farm, Westerwood in 1868 It has been scanned and a video produced. Cumbernauld's history stretches at least to Roman times, as Westerwood was a Roman fort on the Antonine Wall, the furthest and most northerly boundary of the Roman Empire. Two Roman temporary camps have been discovered and digitally reconstructed east of the fort, at Tollpark (now covered by Wardpark North) and at Garnhall, similar to the two at Dullatur. One of the most discussed Roman finds from Cumbernauld is a sandstone slab depicting Triton and a naked, kneeling captive. It was found on a farm at Arniebog (between the runway of Cumbernauld Airport and Westerwood Golf Course). The slab can now be viewed at the Hunterian Museum in Glasgow along with an uninscribed altar from Arniebog and other artefacts like the inscribed altar, and statuette found at Castlecary and an older copy of the Bridgeness Slab. In addition to these, an altarstone to Silvanus and the Sky dedicated by a centurion named Verecundus and his wife has been found. Cumbernauld also has the only Roman altar still in the open air in Scotland: the Carrick Stone. The stone has also been linked with Robert Bruce, being the place where he reportedly set up his standard on his way to Bannockburn. There is a some evidence that coffins were laid on top of the stone on their way to the cemetery in Kirkintilloch and that the stone has been somewhat worn away. Cumbernauld's name probably comes from the Gaelic comar nan allt, meaning "meeting of the waters". There are differing views as to the etymology of this. One theory is that from its high point in the Central Belt, its streams flow both west to the River Clyde and east to the Firth of Forth so Cumbernauld's name is about it being on a watershed. Another theory ascribes the name to the meeting point of the Red Burn and Bog Stank streams within Cumbernauld Glen. 'Cumbernauld' is generally considered to be a Gaelic name. However, early forms containing Cumyr- hint at a Cumbric predecessor derived from *cömber, 'confluence' (c.f Welsh cymer, 'confluence'), synonymous with Aber. This seems to be suffixed with Cumbric *-ïn-alt, a topographical suffix perhaps referring to a hill or slope (Welsh yn allt, 'at a hill'). Blaeu's map from 1654 based on Pont's original c.1596 "The East Central Lowlands (Stirling, Falkirk & Kilsyth) - Pont 32" map depicting Cumbernad Caſt., Dulettyr, W. Wood, Caſtel Cary, Ridburn and the mysterious Horſeward B. There is a record of the charter of the lands of Lenzie and Cumbernauld, granted to William Comyn by Alexander II in 1216. Cumbernauld Castle was first built as a Norman-style motte and bailey castle. Owned by the Comyns, it was situated at the east end of the park, where the motte (mound) is still visible. The Flemings took possession of Cumbernauld Castle and its estate (c.1306) after Robert the Bruce murdered the Red Comyn. Robert Fleming was a staunch supporter of Bruce, and one of his companions that day. To provide proof that Comyn was dead, Fleming cut off his head in order to "let the deed shaw", a Fleming family motto ever since. On the 1 October 1310 Robert the Bruce wrote to Edward II of England from Kildrum trying, unsuccessfully, to establish peace between Scotland and England. Abercromby describes Malcolm Fleming as returning home to Inverbervie with the formerly exiled 21-year-old King David II. Around 1371, the family built a second castle where the Cumbernauld House now stands. One castle wall exists but most of the stonework was recycled for the House or other buildings. King Robert III knighted Malcolm and granted Sir Malcolm Fleming and his heirs the charter to Cumbernauld Castle on 2 April 1406, just two days before the king's death. Malcolm (and his heir in 1427) were used as hostages to ransom James I back from the English. He also seems to have been arrested by James and imprisoned briefly in Dalkeith Castle. In 1440, this Malcolm Fleming attended the Black Dinner along with his 16-year-old friend Earl William Douglas and his 11-year-old brother David Douglas at Edinburgh Castle. Immediately after the dinner, at which a black bull's head was served, there was a trial on trumped-up charges and the brothers were beheaded in front of the 10-year-old King James II. Malcolm shared their fate three days later. Malcolm was succeeded by his son Robert. ☠ Skull & Crossbones Headstone in Old Parish cemetery from 1654. The oldest local engraving is from 1625. The castle played host to the royalty of Scotland. James IV (1473-1513) wooed Margaret Drummond at Cumbernauld Castle, where Margaret's sister was married to Lord Fleming. The Drummond sisters lie buried in Dunblane Cathedral following their poisoning, possibly by a government determined to marry an unwilling King James to the sister of Henry VIII of England, Margaret Tudor. The murders made James IV a frequent visitor to Cumbernauld, Margaret Tudor accompanying him on one occasion. It is recorded that during this James' reign in 1500, the Black Death led to a special plea from the surviving people of Cumbernauld to the church authorities in Glasgow to allow them to establish their own cemetery rather than taking all their dead to St. Ninian's in Kirkintilloch. They were granted permission to do so, and used the ground at the existing Comyns' chapel which dates from the end of the 12th century. In 1640, eighteen Scottish noblemen met at Cumbernauld to sign the Cumbernauld Bond to oppose the policies of the Earl of Argyll who controlled the dominant political faction in Scotland. Cumbernauld may have been created a Burgh of barony in 1649, although there is some dispute from Hugo Millar. The Earl of Wigton was ordered to garrison the castle in 1650. Cumbernauld Castle was besieged and largely destroyed by Cromwell's General Monck in 1651. Irvine records that the old castle was burned to the ground by "a party of Highlanders during the rebellion of 1715." Cumbernauld House, which still survives, was designed by William Adam and built in 1731 near the older castle. In 1746, the retreating Jacobite army was billeted for a night in Cumbernauld village. Rather than stay in Cumbernauld House, the commander, Lord George Murray, slept in the village's Black Bull Inn, where he could enforce closer discipline on his soldiers. After the new house was built, the castle was converted to stables, but was accidentally burnt down by dragoons posted there in 1746. The House's grounds, located in the Glen, are used today as a park, known as Cumbernauld Park. Workers laboured on about 40–50 farms and details from 1839 have been recorded for both arable and livestock farming. Some of them were said to make a "very considerable income" for their owners. Weaving was an important part of the town's industry particularly during the Industrial Revolution. Irvine records that in 1841 a fifth of the whole population of 4501 people worked on about 600 hand looms. Cotton weaving was not a lucrative profession; in fact cottage workers struggled to make ends meet especially when competing with ongoing industrialisation. In October 1878, this was compounded by the failure of the Bank of Glasgow in which much of the village's money was invested. Many lowland workers migrated and Groome's Gazetteer 1896 records a dwindling population and states "Handloom weaving of checks and other striped fabrics is still carried on, but mining and quarrying are the staple industry." There tended to be plenty of work but even for skilled labourers like the nearby Calton weavers, times were very hard. The mining and quarrying industries flourished after the completion of the Forth and Clyde Canal in 1790. Quarrying of limestone, coal and clay took place in Cumbernauld, for example at Glencryan, where adits to the old fireclay mines are still clearly visible. Groome's Gazetteer (1882-6) states: "A colliery is at Netherwood [just north of the airport]; ironstone has been mined to a small extent by the Carron Company [at Westerwood farm]; and limestone, brick-clay, sandstone, and trap are all of them largely worked, the sandstone for building, the trap for road-metal, paving, and rough masonry." The mine at Netherwood was hand-pumped, although other mines in Cumbernauld had machine pumps to clear them of water. There was a fire clay works at Cumbernauld owned by the Glenboig Union Fireclay Company Limited. Cumbernauld railway station was built by the Caledonian Railway and opened in August 1848 on their line from Gartsherrie (on the former Garnkirk and Glasgow Railway) to Greenhill on the Scottish Central Railway. It closed within a year but re-opened in the 1870s. Parish records give a snapshot of heads of family's occupations in 1835 and 1839 including several bakers, servants, shoemakers and wrights. The Ordnance Survey Name Books of 1860 provide land-use information from around the same period. Cumbernauld was long a staging-post for changing horses between Glasgow and Edinburgh and there were several inns and a smiddy as well as half a dozen coaches a day to various towns. Old maps like the 1899 O.S. map show other employment like a gas works and a stocking factory in The Village and a corn mill at Lenziemill close to the old brick and pipe works. Three schools were run but the teachers were not always paid by the heritors. There were several church ministers and the Established church paid, out of collections, about 25 poor people a week who couldn't support themselves. Groome also records clerical work as there was a post office, two banks (held two days a week in a room in the inn) and a library with a newsroom. Towards the end of the 1890s, Jane Lindsay (also called Luggie Jean on account of having three ears according to Millar) was murdered in a pool of water on the edge of Fannyside Moor. The forensic experts, professors at Glasgow and Edinburgh, appeared as witnesses on opposing sides and a not proven verdict was returned. Historically Cumbernauld has variously been in several administrative jurisdictions including Stirlingshire, Dunbartonshire (sometimes spelled Dumbartonshire), and the Cumbernauld and Kilsyth District of Strathclyde region. Since 1995 it has been part of North Lanarkshire. The arms of Cumbernauld and Kilsyth District Council featured the white cattle and the Vulcan sounding motto of "Daur and Prosper" boldly asserting Dare and Prosper. However the open Bible and the miner's lamp were the only symbols which were carried on to the North Lanarkshire coat of arms. These blue bridges are all over the town. View from Hillcrest. Cumbernauld was designated a New Town on 9 December 1955. Being in the post-war era there are abundant film, photographic and paper records of this which are now being digitised. There was an inaugural ceremony on 28 June 1957 with Viscount Muirshiel, Secretary of State for Scotland of which some silent, colour footage survives. See the On film and TV section for link to this and other footage from this period. After the Second World War, Glasgow was suffering from a chronic shortage of housing and poor housing conditions, particularly in areas such as the Gorbals. As a direct result, the Clyde Valley Regional Plan 1946 allocated sites where satellite new towns were to be built to alleviate the problem through an overspill agreement. Glasgow would also undertake the development of its peripheral housing estates. Cumbernauld was designated as a New Town in 1955, the third to be designated in Scotland. The others were East Kilbride, Glenrothes, Livingston and Irvine (Cowling 1997). The development, promotion and management was undertaken, until 1996, by the Cumbernauld Development Corporation (CDC). This was a quango appointed by the Secretary of State for Scotland (Cowling 1997). The area allocated was 4,150 acres (1,680 ha) lying between and incorporating the existing villages of Condorrat and Cumbernauld. The first new housing became available in 1958. An additional 3,638 acres (1,472 ha) was added to the designated town area on 19 March 1973 to accommodate a revised target population of 70,000. Cumbernauld is the clearest example of a modernist new town vision in the UK. Housing was originally built in a series of satellite neighbourhoods clustered around the hilltop town centre. Separation of people and cars was a major element of the first town master plan, and this was carried through for much of the development of the town. Cumbernauld pioneered designs for underpasses and pedestrian footbridges as well as segregated footpaths. This seemed strange to many settlers arriving from Glasgow, and the town's nickname of Noddy Land (Glaswegian sometimes Noddytown) was coined. Early neighbourhoods were designed by the CDC and were constructed at Ravenswood, Muirhead, Seafar and Kildrum, north of the Town Centre and Carbrain to the south. Other neighbourhoods were later developed at the Village, Greenfaulds, Condorrat, and Abronhill. Much of the housing in these areas won awards for their innovative designs. Cumbernauld town centre's lead designer was Geoffrey Copcutt. Phase 1 was opened by Princess Margaret in 1967, of which some footage survives. When originally designated as a New Town, the target population was 50,000. In 1961, only five years after becoming a new town, the area to the north of the A80 was added to the town's area with new planned neighbourhoods at Westfield, Balloch, Westerwood and Carrickstone. As a result, a revised target population of 70,000 was set. However, the 2011 census still only shows about 52,000 residents. When Raymond Gillies, a local businessman, gifted Cumbernauld the St. Enoch's station clock, in 1977, the Queen was celebrating her Silver Jubilee. To mark the occasion, the Queen started the clock using the pendulum motion and unveiled a commemorative plaque at Cumbernauld Town Centre, at the staircase joining the upper mall area with the old Woolco store. The clock is featured in Gregory's Girl and is now in the Antonine Centre. After the creation of the new town, diverse industries such as high-tech, electronics, and chemical and food processing became large employers, along with the Inland Revenue (now Her Majesty's Revenue and Customs). The main industrial estates were developed to the east and west along the A80 at Wardpark and Westfield. Areas at Blairlinn and Lenziemill to the south of the town have also been developed for industry. The Cumbernauld Development Corporation (C.D.C.) disbanded in 1996. The Modern era for the town can be dated from the disbanding of the C.D.C. in 1996. Since then, the outlook has changed dramatically and the New Town has won a number of very unflattering awards including Urban Realm's "Plook on a Plinth" in both 2001, and 2005. In December 2005, the entire Town Centre won a public nomination for demolition in the Channel 4 series Demolition, where it was voted "the worst building in Britain". As a result of this, it was featured on the BBC Radio 2 comedy programme It's Been a Bad Week, where it won the show's fictional "Worst Week of the Week Award, Awarded Weekly, on a Week-By-Week Basis" in 2003. The intended core of Cumbernauld remains the Town Centre buildings, all of which is essentially contained within one structure, segmented into "phases", the first of which was completed in 1967, the latest of which began construction in May 2003 for completion around September 2004. Initially the basic groundwork for the new shops began in 1997 and were finally completed in summer 2007. Designed to be a commerce centre, an entertainment and business venue and a luxury accommodation site, it was widely accepted as Britain's first shopping centre and was the world's first multi-level covered town centre. However, the town never developed to its planned size, and the town centre has never had the life envisaged by town planners. Wealthy occupiers for the penthouses situated within the "Alien's Head" (locals' acerbic moniker for the top section of the building) never materialised. Further expansion has been primarily to provide further space for shops. A substantial portion of the original Shopping Centre was demolished due to structural damage and has been redeveloped as a new shopping and leisure complex. As well as the unfulfilled ambitions for the town, the passage of time has exposed serious defects in post-war concepts of centrally-planned retail and civic centres developed in the absence of proper community consultation or sensitivity to local environmental and economic conditions. This has been reflected in a country-wide backlash against brutalist architecture in general. Cumbernauld's Town Centre is widely regarded as one of the ugliest and least-loved examples of post-war design in Scotland. The confusing layout is an abiding source of frustration for both visitors and residents, many of whom are the descendants of skilled workers who aspired to escape the frequently appalling social and housing conditions of the Glasgow conurbation in the 1960s and 1970s. Despite its bad press, from a purely aesthetic standpoint Cumbernauld is regarded as representing a significant moment in town design, and in 1993 it was listed as one of the sixty key monuments of post-war architecture by the international conservation organisation DoCoMoMo. The residential structure of Cumbernauld is noteworthy in that there were no pedestrian crossings, i.e. zebra or pelican crossings — pedestrians originally traversed roads by bridge or underpass. These underpasses could collect litter, sometimes smelled like public toilets, or were used by local youths trying to keep out of the rain. These are not issues the original planners anticipated, but mean that pedestrians sometimes choose to avoid them, especially at night or if they feel vulnerable. Some efforts have been taken to redress some of these matters but the problem is ongoing. Some well-known companies use Cumbernauld as a base including Mackintosh, and Farmfoods who operate in Blairlinn. Cumbernauld in the last few years has seen a surge of business activity with the OKI UK headquarters moving across town to Westfield close to Yaskawa Electronics. Irn-bru makers A.G. Barr also has its world headquarters in the Westfield part of the town. The old Isola-Werke factory in the Wardpark area has been converted into film studios and production facilities for the TV series Outlander which frequently films within the town's greenspaces. In particular, the Scottish Wildlife Trust's Cumbernauld Glen reserve, has been used as a backdrop whose ancient oak forest remnant provides a convenient stand-in for 18th Century Highlands' scenes. In May 2016, North Lanarkshire Council agreed to the expansion the Wardpark site if funding could be found. Another industrial estate Lenziemill is home to Dow Waste Management and furniture maker Aquapac amongst others. Cumbernauld consists of more than 50% green space, and was designed to incorporate green spaces as a resource for the community. The Scottish Wildlife Trust owns four wildlife reserves in the town – Cumbernauld Glen, Luggiebank Wood, Forest Wood, and Northside Wood. These habitats include ancient Oak forest (with attendant bluebell displays in early summer) and large areas of Scots Pine coverage. Cumbernauld (like Ben Lomond) lies on the Scottish watershed, the drainage divide which separates river systems that flow to the east from those that flow to the west. There are two main waterways which flow out of Cumbernauld: the Red Burn (from which the town's Gaelic name is derived) and the Luggie Water (immortalised by David Gray). The Red Burn flows through the Glen and there are walkways alongside this and the Bog Stank. There is also a footpath along the Glencryan Burn with miles of pathways up towards Pallacerigg and Fannyside Lochs. Fannyside Muir, to the south of the town, is part of the Slamannan plateau, an area of 183 hectares of lowland bog. This habitat is being restored by a variety of organisations including the national insect charity Buglife. The plateau is designated as a SSSI (Site of Special Scientific Interest) and an SPA (Special Protection Area), partly because of its nationally important population of Taiga Bean Geese (Anser fabialis fabialis). There are a large number of parks, and there are also LNRs (Local Nature Reserves) and SINCs (Sites of Importance for Nature Conservation) owned and managed by North Lanarkshire Council. For example St. Maurice's Pond as a SINC and Ravenswood has a LNR. In 1993 Broadwood Loch, a balancing lake, was created by damming the Moss Water and using a plastic waterproof membrane, and a 6-metre (20 ft) wall to hold back the water. This was primarily to prevent flooding downstream but also for recreation. A landscape scale conservation partnership led by the Scottish Wildlife Trust, the Cumbernauld Living Landscape (CLL), operates in the town with the aim of enhancing, connecting and restoring the greenspaces and improving people's perceptions of and access to them. In 2014, the CLL obtained camera trap footage of Pine Martens living in the woods within Cumbernauld and the return of this species (formerly extinct across the Central belt of Scotland) has become a central plank of the organisation's strategy to improve perceptions of nature in the town. In 1967 the Institute of American Architects voted Cumbernauld the world's best new town conferring the Reynold's Memorial Award. Cumbernauld is a two-time winner of the Carbuncle Awards in 2001 and 2005. The town has since received the award of 'Best Town' at the Scottish Design Awards 2012. The Royal Town Planning Institute (RTPI) awarded the town a certificate in March 2014 for its success as a New Town. In 2015 the Town Centre was awarded the Green Apple Environmental Award. Cumbernauld won the 2013 Beautiful Scotland Award for the best "Small City". It has also received silver medals each year since 2009, the most recent being in 2017. In 2017 Cumbernauld was also awarded the Garden for Life Biodiversity Award. Cumbernauld hosts Clyde F.C, who play football in the Scottish League Two and reside at Broadwood Stadium, which has been their home since they relocated from their traditional base of Glasgow in February 1994. In 2012, Broadwood Stadium's grass pitch was replaced by a new artificial FIFA standard 3G surface in a partnership between fellow tenants and Lowland League club Cumbernauld Colts, North Lanarkshire Leisure and the local council. Cumbernauld is home to Junior football side Cumbernauld United who play at Guy's Meadow. Five-a-side can be played at the Tryst or Broadwood who also have seven-a-side and full size pitches. Pitches are bookable at Ravenswood and Oak Road too. Broadwood also has a BMX track and spin classes for cycling. Guy's Meadow – Cumbernauld United F.C. The town's rugby team, Cumbernauld RFC, were formed in 1970 and grew to have 3 senior men's teams and several junior teams. The club and council agreed in the late 1970s to develop the Auchenkilns area in South Condorrat. The multi-sports facility opened in 1979 and is now shared with Kildrum United FC. They play in West regional league 2, the 5th tier of club rugby. The Cumbernauld Gymnastics Club moved into its base at Broadwood Gymnastics Academy in the early 1990s it, a purpose built building at the same site as Broadwood Stadium. They also have tennis and short tennis at Broodwood. Dance classes are held at a number of location including Cumbernauld Theatre which also has drama classes and programmes. The Cumbernauld Handball Team, Tryst 77, which in 2007 came second in the British Handball Championships. The Tryst houses the Cumbernauld swimming team, the Tryst Lions wrestling club and squash and badminton courts as well as gyms. Martial arts are practised in The Link, the Tryst and at Broodwood. Raw Taekwondo also have a centre at Westfield Industrial Estate. The Palacerigg Field Archers, that meets for practice at the Tryst Sports Centre and has an archery course at the nearby Palacerigg Country Park where competitions are held. Palacerigg also has one of the town's three golf courses (although this has been converted as a dedicated Footgolf course, the only such facility in Scotland); The other two are Dullatur Golf Club, and Westerwood, which was designed by Seve Ballesteros and Dave Thomas. Snooker is played at the Red Triangle. Bowling is played in the Village, at Ravenswood and in Condorrat. A small attraction World of Wings near Blairlinn houses a collection of birds of prey, offering flying displays and conservation activities. Cumbernauld Airport main building and part of runway. In terms of public transport, Cumbernauld has bus links to Glasgow, including the airport, Stirling, Falkirk, Dunfermline and St Andrews, which are operated by FirstGroup and Stagecoach. Various parts of the town are linked by local bus services, operated by smaller companies such as Canavan Travel and Dunn's Coaches. Rail services to and from the town are provided by Abellio ScotRail. The town has rail links to Glasgow, Falkirk, Motherwell and Edinburgh via Cumbernauld railway station. There is also a station at Greenfaulds. Croy railway station to the north of the town has rail links to Edinburgh, Alloa, Dunblane and Glasgow. A fully electric service to Falkirk Grahamston is proposed using the Cumbernauld Line. Other working lines include the Argyle Line and the North Clyde Line. Nearby motorway links include the M8, M73, M74, M80, M876 and M9. A local campaign was recently initiated to protest at the proposed extension of the M80 within the town limits. The A80 was recently upgraded to the M80. Cumbernauld Airport (EGPG) is primarily used for the training of fixed wing and rotary wing pilots, it also has an aircraft maintenance facility. The airport has a CAA Ordinary Licence that allows flights for the public transport of passengers or for flying instruction as authorised by the licensee, Cormack Aircraft Services Limited. The airport was opened by the Cumbernauld Development Corpororation in the late 1980s. Before the airport was constructed there was a grass strip in use on the same site. The local Cumbernauld newspaper is the Cumbernauld News. Revival FM is a Christian based community radio station in Scotland, operating under a Community Radio Licence. Cumbernauld have 11 council members out of 69 North Lanarkshire Councillors. Jamie Hepburn is the area's elected MSP for the Scottish Parliament constituency. He is also a member of the Scottish National Party. As part of the Central Scotland region there are 7 additional MSPs. Of these four are Labour (Mark Griffin, Monica Lennon, Richard Leonard and Elaine Smith; and 3 are Conservative (Alison Harris, Margaret Mitchell and Graham Simpson). Stuart McDonald is the area's elected MP for the UK Parliament constituency. He is a member of the Scottish National Party. As he said in his maiden speech he has sometimes been mistaken for his namesake who is also an SNP MP. There are also 6 MEPs for Scotland (European Parliament constituency). They are members of 4 different parties. The New Statistical Accounts of Scotland (April 1839) described 3 schools: Cumbernauld Village 80–90 pupils, Condorat [sic] 60–70 pupils, Garbethill [East Fannyside] 20 pupils. It records "few people between 6 and 15 are unable to read the Bible". Groome's Gazetter (1896) has "Three public schools – Cumbernauld, Condorrat, and Arns [near today's Abronhill] – and Drumglass Church school, with respective accommodation for 350, 229, 50, and 195 children, had (1880) an average attendance of 225,98,30, and 171." With the coming of the railway a new school was built after some controversy. Opening in 1886, it was known as the Southern District School and was close to the railway station. Historical New Town primary schools include: Cumbernauld Primary (village), Glenhead Primary, Hillcrest Primary (Carbrain Temporary School), Langlands Primary, Melrose Primary, Muirhead Primary, Sacred Heart Primary, Seafar Primary, and St Joseph's. Historical New Town secondary schools include: Abronhill High (Closed as of July 2014) and Cumbernauld High (became Cumbernauld Academy). Greenfaulds High School with new school building which opened in September 2016, old building has since been demolished. Historically Groome's Gazetteer stated "pre-Reformation chapels are thought to have existed at Achenbee, Achenkill, Chapelton, Kildrum, Kilmuir, and Croy." Cumbernauld Old – The historical Groome's Gazetteer has "The parish church here is an old building, containing 660 sittings." Sacred Heart Church in Kildrum, Cumbernauld. with architecture by Gillespie, Kidd & Coia. Cumbernauld Free Church – Historically Groome's Gazetteer states "the Free church dates from 1826, having belonged to the Original Secession, but has been lately almost rebuilt; and there is also a new United Presbyterian church." A purpose-built mosque opened in 2011. Cumbernauld (1957) colour 2 mins. Cutting turf silent – inaugural ceremony on 28 June 1957 with Viscount Muirshiel, Secretary of State for Scotland. Building New Houses At Cumbernauld. (1959) colour 6 mins possibly Braehead Rd. Kildrum or Fleming Rd. Seafar? British Movietone News (1965) B&W 2 min Roundabout International journalists visit Cumbernauld. The Design of Space (1966) Dir: Don C. Chipperfield (minutes 1–3) with incredible pronunciation of Cumbernauld. New Towns (1969) 22 mins colour. A study of the new towns of East Kilbride, Glenrothes, Cumbernauld and Livingston. Marshall-Orr (1975) 17 mins colour silent Has some footage of the Town Centre and railway station. Cumbernauld HIT (1977) 44 mins colour. A James-Bond type fiction film about an evil woman's plans to 'hi-jack' the New Town of Cumbernauld with a bio-weapon dir: Murray Grigor, Sponsor: CDC. Has some chase sequences round the old Town Centre. Gregory's Girl Bill Forsyth's 1981 film set in Abronhill High and around the town. The name of the town in the film was Climackston New Town (sic) and it was signed as being 20 miles from Glasgow, 25 miles from Edinburgh and 9000 miles from Caracus. Spaniards in Cumbernauld (2016) – A 13-minute documentary in English made for an HND project. Night-time Window on Wildlife (2017) 4 mins - Cumbernauld Living Landscape's footage with volunteers' help. It's a Knockout (1981) BBC 45 mins Dunfermline vs Cumbernauld vs Glenrothes (can be found with video search). STV's The Riverside Show had a 12 minute piece by Lizzie Clark on 28 Aug 2014 including interviews with Councillor Tom Johnston and Outlander producer David Brown. STV had a short piece about the positives of the town: Reasons Cumbernauld is possibly the best place in Scotland. Happy Birthday to the Town for Tomorrow! (May 2017) 3 mins - Short BBC compilation for 50th; includes Dudley Leaker. A look back at the town of Cumbernauld (December 2017) 4 mins - Sixty years on from Cumbernauld's inauguration as a new town, BBC Rewind visits to see how it has changed and hear the memories of some of the first residents. The Outlander TV series used Wardpark Studios as its base for sets. Several scenes from the TV series were shot in local woodland. In May 2016 approval was given to expand the site from 30,000 sq ft to 78,000 sq ft. Marvel's Infinity War is being filmed at locations in Scotland and the Wardpark Studios are being used for CGI. Many of Cumbernauld's residential areas retain the names of previous farms in their vicinity. ^ "Cumbernauld (North Lanarkshire, Scotland, United Kingdom) - Population Statistics, Charts, Map, Location, Weather and Web Information". www.citypopulation.de. Retrieved 18 April 2019. ^ "Table 1: 2011 census locality populations". North Lanarkshire Council. ^ "Scots Culture - Names in Scots - Places in Scotland - Scots Language Centre". Scotslanguage.com. Retrieved 2011-10-30. ^ "Ainmean-Àite na h-Alba - Gaelic Place-Names of Scotland - Database". Gaelicplacenames.org. Retrieved 2011-10-30. ^ Osborn, Frederic James; Whittick, Arnold (1963). The New towns - The Answer to Megalopolis. London: McGraw-Hill. pp. 312–321. Retrieved 25 October 2017. ^ Macgeorge, Andrew (1880). Old Glasgow : the place and the people from the Roman occupation to the eighteenth century. Glasgow: Blackie and son. p. 43. Retrieved 12 October 2017. ^ "Fragment of possible Distance Slab, Arniebog, Westerwood". Retrieved 19 May 2018. ^ Macdonald, George (1933). Proceedings Of The Society Of Antiquaries Of Scotland 1932-1933 Vol.67. Edinburgh: Neill and Co. Ltd. pp. 277–296. Retrieved 23 November 2017. ^ Macdonald, Sir George (1934). The Roman wall in Scotland, by Sir George Macdonald (2d ed., rev., enl., and in great part rewritten ed.). Oxford: The Clarendon press. pp. 241–258. Retrieved 11 October 2017. ^ "Reconstruction model, Tollpark Temporary Camp". Retrieved 19 May 2018. ^ "Tollpark". Frontiers of the Roman Empire. Retrieved 21 October 2017. ^ "Reconstruction model, Temporary Camp, Garnhall". Retrieved 19 May 2018. ^ "Garnhall". Frontiers of the Roman Empire. Retrieved 21 October 2017. ^ The Scottish antiquary, or, Northern notes & queries. Edinburgh: T. and A. Constable. 1890. Retrieved 12 October 2017. ^ Buchanan, John (1883). Transactions of the Glasgow Archaeological Society (Vol II ed.). St. Vincent Street, Glasgow: James Maclehose & Sons. pp. 66–77. Retrieved 12 October 2017. ^ "distance slab (possible) decorated with triton and kneeling captive". Hunterian Museum. University of Glasgow. Retrieved 12 October 2017. ^ "Uninscribed altar, Arniebog, Westerwood". Retrieved 21 October 2017. 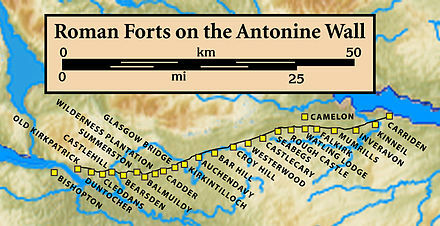 ^ "The Antonine Wall: Rome's Final Frontier". The Hunterian. University of Glasgow. Retrieved 10 October 2017. ^ "NLC_Altar_To_Flavius_Verecundus_Update". Retrieved 21 October 2017. ^ "Westerwood". Frontiers of the Roman Empire. Retrieved 21 October 2017. ^ "Roman altar, near (sic) Cumbernauld". Retrieved 21 October 2017. ^ "HAZARD INFORMATION FOR TEACHERS CARRICK STONE: ALTAR" (PDF). Frontiers of the Roman Empire. Retrieved 13 October 2017. ^ Grant, Clare (2 April 2003). "Saga of the Carrick Stone". Cumbernauld News. Retrieved 13 October 2017. ^ Watson, Thomas (1894). Kirkintilloch, town and parish. Glasgow: J. Smith. p. 121. Retrieved 13 October 2017. ^ Donelly, W. A. (1892). Proceedings of the Society of Antiquaries of Scotland. Edinburgh: Neill & Co. pp. 228–230. Retrieved 13 October 2017. ^ Drummond, Peter, John (2014). An analysis of toponyms and toponymic patterns in eight parishes of the upper Kelvin basin (PDF). Glasgow: Glasgow University. pp. 232–234. Retrieved 3 July 2017. ^ James, Alan G. The Brittonic Language in the Old North A Guide to the Place - Name Evidence (PDF). Volume 2 - Guide to the Elements. pp. 109–110. Retrieved 3 July 2017. ^ Hunter, William (1868). Biggar and the House of Fleming: an account of the Biggar district, archaeological, historical, and biographical. Edinburgh: William Paterson. p. 469. Retrieved 12 May 2018. ^ Abercromby, Patrick. The martial atchievements of the Scots nation. Edinburgh: R. Freebairn. p. 81. Retrieved 5 August 2016. ^ Abercromby, Patrick. The martial atchievements of the Scots nation. Edinburgh: R. Freebairn. p. 270. Retrieved 5 August 2016. ^ "Dictionary of National Biography, 1885-1900, Volume 23". Retrieved 5 August 2016. ^ The martial atchievements of the Scots nation. p. 273. Retrieved 5 August 2016. ^ Mackie, Charles (1835). The castles of Mary, Queen of Scots; being a historical description of every castellated erection which formed a residence or a prison to that Queen (3d ed.). London: T. Tegg. pp. 81–82. Retrieved 5 August 2016. ^ Abercromby, Patrick. The martial atchievements of the Scots nation. Edinburgh: R. Freebairn. pp. 329–331. Retrieved 5 August 2016. ^ Almon, J. (1767). The peerage of Scotland; a genealogical and historical account of all the peers of that ancient kingdom ... London. p. 103. Retrieved 5 August 2016. ^ Renwick, Robert; Lindsay, John, Sir, (1921–34). History of Glasgow (Vol 1 ed.). Glasgow: Maclehose, Jackson & Co. p. 337. Retrieved 16 October 2017. ^ "Mary Queen of Scots tree shortlisted for Scottish Tree of the Year 2014". History Scotland. Retrieved 24 June 2017. ^ Brome, James (1707). Travels over England, Scotland, and Wales. p. 187. Retrieved 5 August 2016. ^ Storer, John, of Hellidon (1879). The wild white cattle of Great Britain. An account of their origin, history, and present state. London, New York [etc. ]: Cassell, Petter, Galpin & co. pp. 326–327. Retrieved 11 August 2016. ^ "Scottish National Dictionary (1700–)". DSL Dictionary of the Scots Language. Retrieved 8 August 2016. ^ Napier, Mark (1856). Memoirs of the Marquis of Montrose. Edinburgh: T.G. Stevenson. pp. 254ff. Retrieved 24 June 2017. ^ Website, Scottish Mining. "Misc. Areas - Scottish Mining Website". ^ "History". Cumbernauld Community Development Trust. Retrieved 2 August 2016. ^ "Brickworks Cumbernauld (1957)". Retrieved 1 March 2018. ^ "CUMBERNAULD VILLAGE CONSERVATION AREA Supplementary Planning Guidance: SPG 27 - NLLP Policy NBE.1 and NBE.2". North Lanarkshire Council. Retrieved 25 February 2017. ^ "FireClay and FireBricks". Monklands Memories. Retrieved 28 February 2018. ^ "Netherwood". 25 inch map with Bing overlay. Ordnance Survey. Retrieved 28 January 2018. ^ "Ross' map". NLS. Retrieved 27 January 2018. ^ a b Dunbartonshire OS Name Books (Dunbartonshire volume 05 ed.). Scotland's Places. 1860. Retrieved 25 February 2017. ^ "Stirlingshire Sheet XXIX.SW (includes: Cumbernauld; Kilsyth)". National Library of Scotland. Retrieved 2018-02-25. ^ "Jean's Hole". Open Street Map. Retrieved 8 August 2016. ^ Carlisle, Nicholas (1813). A topographical dictionary of Scotland, and of the islands in the British seas. Compiled from the most authentic documents, and arranged in alphabetical order. Being a continuation of the topography of the United Kingdom of Great Britain and Ireland. By Nicholas Carlisle. London: G. and W. Nicol. Retrieved 15 October 2017. ^ "Cumbernauld and Kilsyth". Heraldry of the World. Retrieved 3 April 2017. ^ "North Lanarkshire". Heraldry of the World. Retrieved 3 April 2017. ^ Taylor, Jessica (2010). Cumbernauld: The Conception, Development and Realisation of a Post-war British New Town (PDF). Edinburgh: Edinburgh College of Art. pp. 410–424. Retrieved 25 February 2017. ^ Fraser, W Hamish. "Modern Times: 1950s to The Present Day - Neighbourhoods -New Towns". TheGlasgowStory. Retrieved 2010-05-08. ^ Taylor, Jessica (2010). Cumbernauld: The Conception, Development and Realisation of a Post-war British New Town (PDF). Edinburgh: Edinburgh College of Art. pp. 178–179 and 281. Retrieved 25 February 2017. ^ a b "From Here To Modernity Buildings - Cumbernauld Town Centre". Open2.net. 1955-12-09. Retrieved 2018-05-07. ^ "Cumbernauld". Heraldry of the World. Retrieved 3 April 2017. ^ "New Life". Scotland on Film. BBC. Retrieved 20 May 2017. ^ "Paddington Grabbed". The Hidden Glasgow Forums. Retrieved 20 May 2017. ^ Room, Adrian (2006). Nicknames of Places: Origins and Meanings of the Alternate and Secondary Names, Sobriquets, Titles, Epithets and Slogans for 4600 Places Worldwide. McFarland & Company. p. 182. Retrieved 20 May 2017. ^ Taylor, Jessica (2010). Cumbernauld: The Conception, Development and Realisation of a Post-war British New Town (PDF). Edinburgh: Edinburgh College of Art. p. 191. Retrieved 25 February 2017. ^ "Site Record for Cumbernauld, Cumbernauld Town Centre, General Town Centre Details". Canmore.rcahms.gov.uk. Retrieved 2011-10-30. ^ https://cumbernauldhousetrust.wordpress.com/about/ End of the C.D.C. ^ "UK | Scotland | Officials condemn 'Carbuncle' tag". BBC News. 2005-10-21. Retrieved 2011-10-30. ^ "Demolition". Channel 4. 2005. Retrieved 2011-10-30. ^ "What's it called? Carbuncle-nauld". Airdrie & Coatbridge Advertiser. Scottish and Universal Newspapers. 21 November 2001. [T]he centre is topped by a rather unsightly block...Cumbernauld residents dubbed [it] the 'Alien's Head', in homage to ET. ^ Caro Ramsay (6 December 2013). "What's it called? Cumbernauld!". Murder is Everywhere. Retrieved 9 February 2014. ...the centre's penthouses located within the 'alien's head' lie empty and derelict. ^ "Antonine Centre website". Archived from the original on 2007-05-20. Retrieved 2007-04-16. ^ Campbell, Scott (August 2013). "Cumbernauld takes battering over 'ugliest UK centre' once again". Cumbernauld Media. Retrieved 6 August 2016. ^ "Craiglinn Underpass". world landscape architect. Bigg Design. Retrieved 13 August 2016. ^ "The rebirth of the Mackintosh fashion label". The Scotsman. 8 February 2011. Retrieved 27 January 2018. ^ McCulloch, Scott (22 February 2017). "Farmfoods report 14% drop in annual sales". Insider Publications Ltd. Retrieved 10 February 2018. ^ Campbell, Scott (24 June 2015). "Farmfoods seek permission to expand Cumbernauld HQ". Cumbernauld Media. Retrieved 6 August 2016. ^ McCulloch, Scott (18 January 2018). "Yaskawa Electric UK reports strong revenue and profit growth". Insider Publications Ltd. Retrieved 10 February 2018. ^ McCulloch, Scott (2 August 2017). "Irn-Bru maker AG Barr see sales rise to £136m after being boosted by new products". Insider Publications Ltd. Retrieved 10 February 2018. ^ "Cumbernauld firm identified as an inspiration to Britain". Cumbernauld News. 17 May 2018. Retrieved 19 May 2018. ^ Gourley, Perry (14 September 2017). "How the deals market is holding up well in the face of economic volatility". Insider Publications Ltd. Retrieved 10 February 2018. ^ "About the project". Cumbernauld Living Landscape. Retrieved 6 August 2016. ^ "Cumbernauld Glen". Scottish Wildlife Trust. Retrieved 6 August 2016. ^ "Luggiebank Wood". Scottish Wildlife Trust. Retrieved 6 August 2016. ^ "Forest Wood". Forest Wood. Scottish Wildlife Trust. Retrieved 6 August 2016. ^ "Northside Wood". Northside Wood. The Scottish Wildlife Trust. Retrieved 6 August 2016. ^ Lambert, Tracy (3 June 2015). "Why St Maurice's pond is a special place!". Cumbernauld Living Landscape. Retrieved 6 August 2016. ^ "Local Nature Reserves". North Lanarkshire Council. Retrieved 6 August 2016. ^ Campbell, Scott (26 June 2015). "Open day celebrates the natural beauty of Ravenswood". Cumbernauld Media. Retrieved 6 August 2016. ^ a b "Cumbernauld voted best town after double 'plook' shame". BBC News. 2012-05-25. ^ Campbell, Scott (11 September 2015). "Cumbernauld Shopping Centre picks up environmental award". Cumbernauld Media. Retrieved 6 August 2016. ^ "Cumbernauld shakes off the 'Carbuncle' tag". HeraldScotland. 11 Sep 2013. Retrieved 17 September 2016. ^ Campbell, Scott (3 May 2014). "Cumbernauld gets ready to defend its Beautiful Scotland title". Cumbernauld Media. Retrieved 17 September 2016. ^ "2017 Medals". Beautiful Scotland. Retrieved 21 October 2017. ^ "Cumbernauld's Bloomin' Wild". Keep Scotland Beautiful. Retrieved 21 October 2017. ^ MacLean, Ian. "BMX action at Cumbernauld". Cumbernauld News. Retrieved 5 October 2016. ^ "Players turn out in force for Cumbernauld event". Cumbernauld News. 19 August 2016. Retrieved 5 October 2016. ^ "Information - Cumbernauld Rugby Club". ^ Maclean, Ian (11 January 2018). "Cumbernauld handball club Tryst 77 celebrates 40 glorious years". Cumbernauld News. Retrieved 13 January 2018. ^ Maclean, Ian (24 August 2016). "New Taekwondo centre can help boost sport". Cumbernauld News. Retrieved 5 October 2016. ^ "Some facts about us". Footgolf Cumbernauld. Retrieved 1 September 2018. ^ "World of Wings". VisitScotland. Retrieved 1 September 2018. ^ Campbell, Scott (11 November 2015). "Bus stance improvements nearing". Cumbernauld Media. Retrieved 6 August 2016. ^ "First ever Airlink bus from Cumbernauld to Glasgow Airport ready for launch". Cumbernauld News. Retrieved 10 August 2016. ^ "Jamie Hepburn MSP". The Scottish Parliament. Retrieved 6 August 2016. ^ Campbell, Scott (21 May 2015). "Cumbernauld's MP is officially sworn in". Cumbernauld Media. Retrieved 6 August 2016. ^ Campbell, Scott (16 July 2015). "MP McDonald makes maiden speech". Cumbernauld Media. Retrieved 6 August 2016. ^ "Stuart C. McDonald MP". UK Parliament. Retrieved 6 August 2016. ^ Fairweather, Iain. "primary school". Our Cumbernauld. Retrieved 10 February 2018. ^ "Southern District School". 25 inch O. S. map. Ordnance Survey. Retrieved 10 February 2018. ^ "Cumbernauld has new school as Greenfaulds High School opens". Cumbernauld News. Retrieved 4 October 2016. ^ Campbell, Scott (20 January 2015). "Work starts on new Cumbernauld school campus". Retrieved 6 August 2016. ^ "Churches in North Lanarkshire". Catholic churches and weekday Mass times. Retrieved 21 August 2016. ^ "Greenfaulds Apostolic Church". Retrieved 21 August 2016. ^ "Cornerstone House". Retrieved 21 August 2016. ^ "Cumbernauld Free Church". Retrieved 21 August 2016. ^ "Freedom City Church, Cumbernauld". Freedom City Church, Cumbernauld. Retrieved 4 November 2017. ^ "Holy Name, Cumbernauld". The Scottish Episcopal Church. Retrieved 21 August 2016. ^ "Cumbernauld A church for the community". The Salvation Army. Retrieved 21 August 2016. ^ "Cumbernauld URC". Retrieved 21 August 2016. ^ Slater's Royal National Commercial Directory of Scotland ... (Royal National Directory of Scotland.) With ... map, etc. Manchester. 1903. p. 444. Retrieved 7 May 2018. ^ Eleventh decennial census of the population of Scotland taken 31st March 1901, with report : volume I. London: HMSO. 1902. p. 144. Retrieved 7 May 2018. ^ Census of Scotland, 1911. Preliminary report on the twelfth census of Scotland. Presented to both houses of Parliament by command of His Majesty. London: H.M. Stationery Office. 1911. p. 20. Retrieved 7 May 2018. ^ Gallion, Arthur B.; Eisner, Simon (1963). The urban pattern; city planning and design, by Arthur B. Gallion and Simon Eisner. Chapter title sketches by Anthony Stoner (2nd ed.). Princeton, N. J.,: Van Nostrand. p. 344. Retrieved 7 May 2018. ^ "Full record for 'CUMBERNAULD NEW TOWN INAUGURAL CEREMONY: 28th June, 1957' (5020) - Moving Image Archive catalogue". ^ "Full record for 'BUILDING NEW HOUSES AT CUMBERNAULD' (5343) - Moving Image Archive catalogue". ^ "Full record for 'GLASGOW' (0915) - Moving Image Archive catalogue". ^ "Look at Life - Living with Cars". Rank. ^ "Cumbernauld · story · British Universities Film & Video Council". ^ "East Anglian Film Archive: The Design of Space, 1966". ^ Pathé, British. "Princess Margaret In Cumbernauld". ^ "NEW TOWNS". National Library of Scotland. Retrieved 2018-02-25. ^ "Full record for 'CUMBERNAULD, TOWN FOR TOMORROW' (2227) - Moving Image Archive catalogue". ^ "Full record for 'GUID GEAR 'SMA' BOOK' (8241) - Moving Image Archive catalogue". ^ "Full record for 'CUMBERNAULD HIT' (4294) - Moving Image Archive catalogue". ^ Gozalves, Tomas. "Spaniards in Cumbernauld". Randomframescompany. Retrieved 25 February 2017. ^ Barclay, Paul (26 July 2017). "Night-time Window on Wildlife". Cumbernauld Living Landscape. Retrieved 28 July 2017. ^ "Town Planning - The New Town of Cumbernauld (1966)". ^ "Gallimaufrey – A Cumbernauld Poem - Scotland on Screen". ^ "Cumbernauld". Moving Image Archive. STV. Retrieved 10 September 2017. ^ "It's a Knockout! [26/06/81] (1981)". ^ Laithwaite, Cara. "New Cumbernauld Fix On STV". Fixers. Public Service Broadcasting Trust. Retrieved 25 February 2017. ^ "Happy Birthday to the Town for Tomorrow!". BBC. 25 May 2017. Retrieved 28 July 2017. ^ "A look back at the town of Cumbernauld". BBC. 31 December 2017. Retrieved 2 January 2018. ^ Beers, Roy. "Marvel-lous new film hit for Cumbernauld". Cumbernauld News. Retrieved 27 February 2017. Wikimedia Commons has media related to Cumbernauld.